4Media YouTube to iPad Converter is an ideal tool to help you download and convert YouTube videos to iPad videos in one-step with rapid speed. It downloads YouTube videos in high speed and then convert them to iPad videos in format such as 720p H.264 HD video, H.264 video and MPEG4. You can also convert FLV files on your computer to iPad videos as well as extract favorite audios from YouTube videos and convert them to iPad music for enjoying on iPad. The most brilliant feature embedded in 4Media YouTube to iPad Converter is its built-in YouTube video browser by which you can browse/search/download YouTube videos easily. Multiple downloading ways are also provided to your preference, such as right click on the video to download, download from YouTube video browser or just drag the video to the application to initiate downloading. With 4Media YouTube to iPad Converter, your iPad will become a portable YouTube video player for you to enjoy YouTube videos offline. Don't hesitate, have a free trial now! Download and convert YouTube videos to iPad videos in format of 720p H.264 HD video, H.264 video or MPEG4 in single-step. Extract audios from YouTube videos and convert them to iPad music in format of MP3 or WAV using this YouTube to iPad Converter. 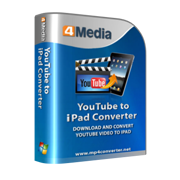 4Media YouTube to iPad Converter is also a converter which converts FLV files on your computer to iPad videos. You can download/convert multiple YouTube videos to iPad at the same time according to your real need. Batch downloading/converting tasks proceed in superior high speed thanks to the multi-thread processing. The built-in YouTube video browser in this YouTube to iPad converter lists YouTube videos by different categories for easy-search. You can download videos from this browser directly. Except downloading YouTube videos from YouTube video browser, two more methods are offered: right click on the YouTube video and use 4Media YouTube to iPad Converter to download and convert or just drag videos to window of the application to initiate downloading/converting. 4Media YouTube to iPad Converter allows you to configure Proxy Server according to the real situation of your network to raise up the wire speed. Exit, hibernate, shutdown, standby or no action after downloading/converting tasks finished to save you from waiting all the time. English, German, Spanish, French, Japanese, Simplified and Traditional Chinese interface languages are available in this YouTube to iPad video converter.